Do y’all got the sauce? 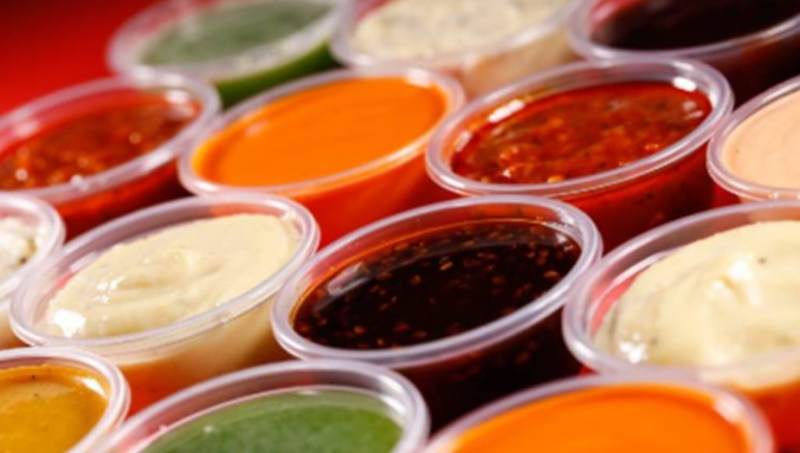 So many sauces, how do we choose? One of the many pleasures in life is the delicious food we get to stuff our faces with. Some of us enjoy Chinese food, maybe Mexican, others prefer classic American, but one thing we almost all have in common is the need for flavor. Some foods provide extreme tangy or spicy scents, others are much blander and require none other than a beloved sauce. Sauce is the key to enhancing a good meal and making it better. It is the extra twang of flavor that you add to spice up a meal. Sauce may be considered necessary to some people in order to eat certain foods. Diving deeper into the discussion of sauce, I decided to ask ELHS students which sauce belongs on what and, well, do they got the sauce? Ketchup is what I feel to be the most ‘common’ sauce. People tend to put it on fries, chicken, burgers, and sandwiches. Most of the time if you order any of these foods at a restaurant, they will ask you if you want ketchup with it when your food comes out. It is a very commonly used sauce in America today. Mustard is another sauce that goes along with ketchup. Its yellowy, creamy texture is used for most of the same foods that ketchup is used for. Personally, I find mustard disgusting as its smell and taste immediately puts me off. Senior Brandon Adams disagrees with me, saying, “Mustard goes well on hot dogs.” I do, however, definitely agree that certain sauces belong on certain foods. Not all sauces can go on just any food and some sauces I feel are specifically made for one food and one food only. The best sauces to exist are buffalo and barbeque. As a huge chicken tender advocate, I crave a mixture of these sauces on my crispy, fried meal. The sweet barbeque reminds you of an outdoor family lunch in the backyard. Or perhaps that spicy buffalo makes the chicken hot and throws in some extravagant flavor. The best part about both of these sauces is that there are so many variations of them. Different restaurants have different flavors and each time you go somewhere new it is a new form of the sauce. Personally, I think Chick-fil-A has the best buffalo sauce and McDonald’s wins best barbeque. The white sauces are what I consider to be the worst sauces. Mayo has got to be one of the nastiest sauces commonly used ever. Its thick, white, oddly creamy texture and rank smell turns me away at the sight of it. Mayo is the type of sauce you send your food back when it comes out with it on it. Apparently, my opinion is not as popular as I thought, as many disagree and like mayo. Junior Griffin Gerlach says, “Mayo can be good especially on Subway sandwiches, but does not belong on everything.” It is a sauce that when used in the right way is delicious to some. Ranch is another white creamy sauce, with a runnier texture than mayo, that goes on salads or vegetables. Again, I dislike how this sauce smells, tastes, and looks but I found very strong disagreement on this sauce in comparison to mayo. Senior Egan Beauvais says, “Ranch is a delicacy that we cannot let go to waste.” Other students agreed, saying ranch is one of the best sauces there is as it can go on so many foods.